ADW has received generous grant support this year for our Courthouse Dogs Program from Planet Dog Foundation and Lineberry Foundation. These foundations’ support of our Courthouse Dogs Program is significant and deeply appreciated. Carrie-Leigh Cloutier is Executive Director of Chaves County CASA, part of a nationwide network of Court Appointed Special Advocates, whose mission is to provide voices for children victims of abuse and neglect who must enter into the judicial system. Chaves County sees roughly 1400 annual referrals of child abuse to social service agencies, and there are several hundred temporary restraining orders filed in cases of domestic violence involving children each year. The picture, said Cloutier, is a grave one — and one replicated in many places around New Mexico and the country. But if nature constitutes the genetic foundation of a successful courthouse facility dog, what comes next is ADW’s nurture in the form of intensive training — which Cloutier described as “mind-boggling” for its methods, complexity and variety. “Jill (Felice) chooses incredibly empathetic dogs. But then the way these dogs are trained — the kindness, the non-aversive training that never uses choke chains — is this beautiful model of non-violence that carries into our work in a gorgeous way,” Cloutier observed. Chaves County CASA received ADW’s very first placement of a courthouse facility dog, Emma, who celebrated her fifth anniversary at Chaves County CASA on August 6th this year. “Having Emma started a fabulous interest in the dogs when people saw the great effect they had,” Cloutier said. Starting with Emma the dogs’ visibility in the community expanded. Even a very negative event — a shooting at Roswell’s Berrendo Middle School in January 2014, which found the dogs and their handlers stepping up as a crisis team to aid the traumatized children — led to the community feeling palpably the impact of the dogs throughout the entire system, Cloutier explained. Cloutier elaborated that Jill and Linda had traveled that day down to Roswell with Honey Pie when the shooting occurred in the gymnasium. Courthouse Dogs Foundation was on site for a planned training, too, with their dog Molly B. With CASA’s Emma and Moose also on hand, the group of handlers and dogs formed an instant crisis team. “We really are a fabulous team,” Cloutier remembered. This system-wide approach has put the dogs at the center of child advocacy in the judicial district, which encompasses the geographically distant cities of Roswell, Carlsbad and Hobbs. Courthouse facility Labradoodle Moose has retired, but Labradors Lincoln and Max still serve in Roswell. Golden Retriever Emma was joined by two-year-old black Lab, Zia, this year in Cloutier’s office. Lydia, who is Zia’s mother, executes her career in Carlsbad. Hobbs keeps MacKenzie busy in her courthouse facility dog vest. On a day-to-day level, there is a lot of variety for these dogs to utilize their special temperaments and gifts. Some, like Emma, are greeter dogs. According to Cloutier, she is an incredible ambassador who can do public appearances in the community, but most often waits patiently at the door of the CASA offices to greet families coming in for the first time. Meeting the dog in that situation helps dispel anxiety and improve therapeutic outcomes for families in the system. Other dogs get petted by children in the sandbox play therapy room. Or offer the kids a big bundle of love to hug during forensic interviews. As parent-child relationship work is supported at the visitation center at CASA’s facility, the dogs are taught to facilitate positive interactions between parents and children, Cloutier explained. Furthermore, the dogs’ effect is also keenly felt on the hard-working staff members who sometimes can have a very tough job. “I can have a staff member way on the other side of our suite of offices who is having a bad day, and wham, without even being asked, Emma is in there by their side with her head on their lap.” Cloutier said. This enthusiasm for the dogs extends to the judges and attorneys — and even to those who are in court because they have been accused of crimes against children. “The dogs don’t just have to be there for the victims. You can have a respondent in court who can’t calm down. The dog comforts him or her as well,” Cloutier said. Cloutier explained that the courthouse facility dogs have not only consistently achieved better outcomes for the victims of child abuse and neglect, they have also changed her life’s work. “It’s the best thing I’ve ever done,” she said. Cloutier will be speaking this October at the 2015 International Courthouse Dogs Conference in Seattle. 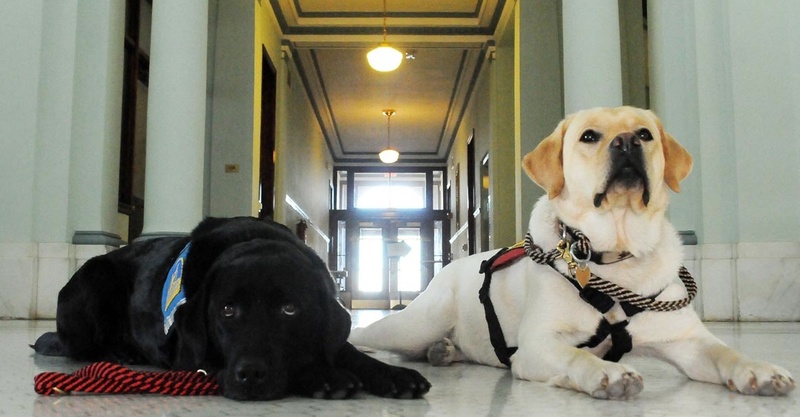 The interest in courthouse facility dogs today extends not only to the United States but to countries like New Zealand and Japan trying to replicate the crisis-team approach. ADW is truly proud to be in the first wave of training courthouse facility dogs for Courthouse Dog Program placements. We have placed 12 dogs since 2010. 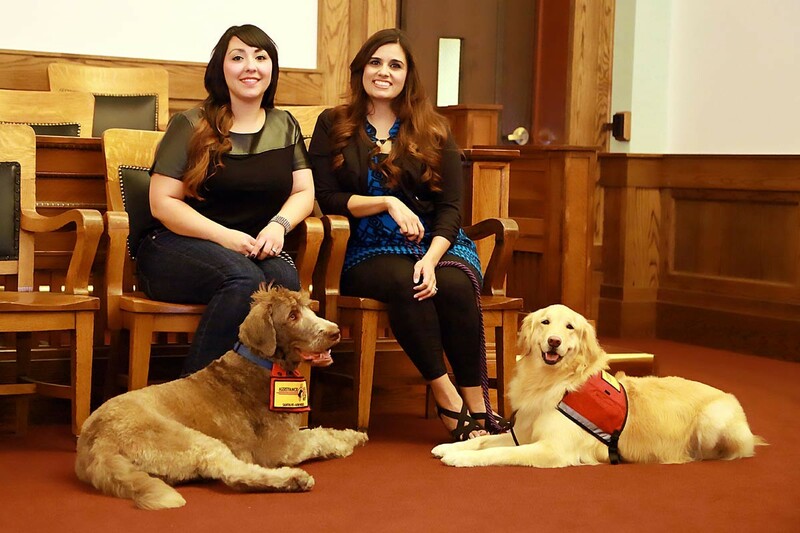 Our most recent placements — Lupe and Dozer — have occurred in the Special Victims Advocate unit in San Bernardino County, California, through the District Attorney’s office. We hope you will support our work now as well and help us reach a $3000 goal to support the training of facility dogs to meet the ever-increasing demand for courthouse facility dogs. You’ll be meeting some of our newly placed courthouse facility dogs at our 2015 graduation ceremony on September 24th. Please show your support today! Become a canine champion!